Will you take your kite? Was it a big city then? 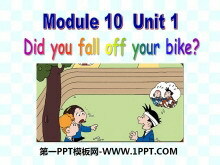 Did you fall off your bike? 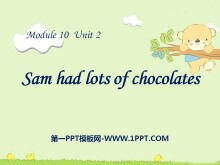 《Sam had lots of chocolates》PPT课件3 Let's chant: Cold cold she had a cold. Fever fever he had a fever. Headache headache shes got a headache. Stomachache stomachache hes got a stomachache. 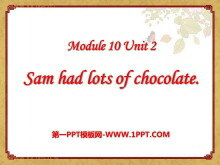 Chant 缩写形式 我..
《Sam had lots of chocolates》PPT课件2 listen to the chant then answer three questions. 1.Whats wrong with Little Tommy? 2.Whats wrong with Little Lingling? 3.Whats wrong with Little Ben? Knowledge小知识 An app..
《Sam had lots of chocolates》PPT课件 chocolate 巧克力 stomache ache 胃疼 watermelon 西瓜 have a cold 感冒 headache 头疼 fever 发烧 Listen and answer. 1. What happened to Sam today? 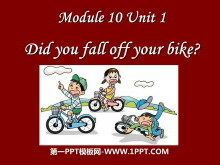 （Sam今天发生了什么事情？） ..
《Did you fall off your bike?》PPT课件3 动词过去式的变法口诀： Yesterday，表过去，要用一般过去式； 规则动词加 ed；有 e 直接加上 d； Talk talk talked; Listen listen listened; Watch watch watched; Phone phone pho..
《Did you fall off your bike?》PPT课件2 Lets chant and do! Left foot right foot left foot right Go straight on then turn around. Left hand right hand left hand right Clap clap clap clap your hands. 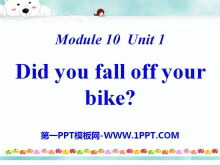 What did ..
《Did you fall off your bike?》PPT课件 Did you fall off your bike? NoSam fell off his bike. fall down 摔倒 fall off 跌落 go for a bike ride 去骑自行车 Sam and I went for a bike ride yesterday. 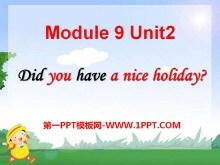 萨姆和我昨天去骑..
《Did you have a nice holiday?》PPT课件 We had a nice holiday. We went to the earth. The people were very nice. But they werent very beautful. Did you .? have a nice holiday 度过一个美好的假期 go to Hangzhou 去..
《Did he live in New York》PPT课件4 牢记不规则动词的过去式。 see --- saw 看见 go --- went 去 make--made制作 am/is--was是 sing --- sang 唱歌 drink--- drank 喝.饮 do ---- did 做 eat ---- ate 吃 take---took 拿，拍..
《Did he live in New York》PPT课件3 This is Damings cousin Dalong. New words postcard cousin New York San Francisco Washington DC dear travel came pop concert says Read the text in groups and find answers. 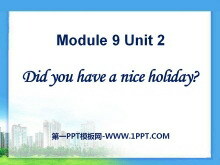 He i..
《Did he live in New York》PPT课件2 Welcome to China! Welcome to Beijing！欢迎来北京！ Did you come by train？ NoI didnt.I came by plane. come----过去式---came Do you like to travel？旅游 How about the US? the ..